Theme: A dark novella about a fourteen year old boy who is convinced that violence is not only okay, but the only acceptable solution and way of being. This is not your average young adult novel. This is not your average kid. Yet there's a disturbing combination of real characters and real life horror in this work from Denis Wright. It's raw, it's strangely powerful, and leaves you with a lot to think about, all in the space of 180 pages. This is the sort of book that will leave my mother shaking her head about how deeply disturbed this generation is. And for once I find I can't disagree with her, though I actually appreciate and in a strange way enjoy how real this feels. 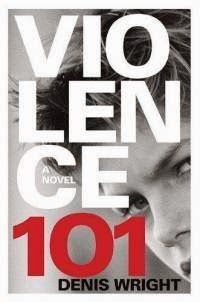 Hamish Graham, the supremely intelligent and stunningly persuasive protagonist of Violence 101, is a deeply troubled individual. And I mean DEEPLY. This is a fourteen year old boy who has been through multiple institutions for young offenders, and on his very first day at the third one (New Horizons) he attacks the biggest guy around to establish himself as top dog. He is convinced that violence is not merely acceptable, but is the solution to every obstacle in his way. He idolises many for whom violence was indeed an answer (if not the answer), most notably Alexander the Great, and can routinely list instances and statistics about violence. This is a boy who worships at the altar of violence, and it is the ultimate way of life in his book. At the same time, the writer is very clear that Hamish is not to be labelled a sociopath or psychopath, seemingly an inherent contradiction but one that is exploited very well. The book itself revolves around a combination of narratives. The dominant one, as you can imagine, is Hamish's. He is under no illusions about his proclivities and his abilities. He embraces his fondness for violence, and is unabashedly open about the idea that he is smarter than those around him (to be fair, he often is) and that this is truly what freaks them out. In a world where denial and positivity are often stressed, Hamish feels he appreciates what life is truly about and the lesser beings around him do not seem to understand the limits they are placing on him and on themselves with their narrowminded approach. This is not a disorder to be cured through therapy - Hamish is all too aware of his passion for violence and considers himself above therapy. Indeed, as far as he's concerned his way is the right way, and others need to learn from him! At the other end of the spectrum, as seen from occasional narration from his headmaster and instructors, there are many who are genuinely concerned about him. Two of them even seem to be getting through to him (despite minor setbacks such as broken arms and whatnot), but this is hampered when Hamish learns that he may be sent to a mental institution and runs away. The unforeseen consequences of his actions, as Hamish is forced to confront the realities of his worldview, are potentially life-altering for Hamish as well as his instructors. This is a very real, visceral narrative that gives you a look at the mind of a character like Hamish. Hamish is that rare type of delinquent, one who is not misguided but is remarkably rational and intelligent when it comes to his dark side. What terrifies many readers, one notes, is not what he does, but that he somehow conveys all his violent tendencies as being not just rational but the right things to do. Wright conveys this very skillfully without actually losing the balance that shows how twisted Hamish is. This is a rare skill, and the narratives are woven together very well to accomplish this. The New Zealand setting, while important, is also not. Wright uses the locale well and the dialogue has Maori expressions tossed in every now and then. This is definitely New Zealand. But the tale is hardly restricted to its setting. This story could take place just about anywhere, and often does. At the heart of the tale is the protagonist's mind, and that is the true setting of the narrative, and is managed in a nuanced manner. Is it worth reading? Yes, provided you can handle the dark, disturbing themes that emerge from such a work. I wouldn't give this book to my parents, or to some of my friends. Of other friends and my sister, I can tell that some of them would engage wholeheartedly with Violence 101. If you're okay with exploring the darker side of human nature, this 180 page inside look at a violent mind is definitely for you.